Much as I would have liked to post more during my stay in Beijing and Shanghai, the Great Firewall of China prevented me from doing so (except when I was staying at my friend's place in Beijing which has VPN). Not only does the Great Firewall reject logging in to Facebook and Twitter but it also prevented me from accessing my own blog. I guess ``blog'' is a dirty word in China. Not surprisingly, the auctions at Beijing Poly International went off great with many records set in various categories including traditional and contemporary Chinese painting. Setting the record for the most ever paid for a painting by a contemporary artist, a large horizontal abstract painting ``Lion Woods'' by master ink painter Wu Guanzhong who died a year ago (1919-2010) sold for 115 million RMB or more than US$17 million. 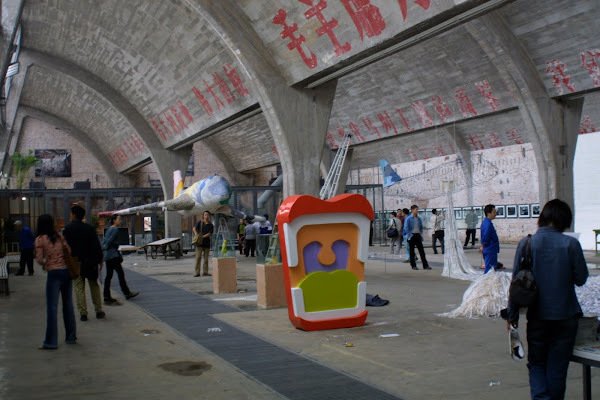 Altogether twenty-five works by the artist were sold at Poly for over 500 million RMB or more that US$77 million. Even more eye-popping was a landscape painting by the iconic 14th century master Wang Meng which sold for 402.5 million RMB or around US$62 million, the third highest price ever paid for a Chinese work at auction. This came on the heels of the China Guardian sale of a hanging scroll awkwardly entitled ``Eagle Standing on a Pine Tree with Couplet'' by the great ink painter Qi Baishi which sold for more than US$65 million. Born in 1864 in central China's Hunan Province, Qi Baishi is especially revered for his depiction of small things, such as birds, fish, fruit and vegetables. He was also known as an outstanding calligrapher. Figures from the art market data organization Art Price show that Qi's works raked in more than 70 million U.S. dollars in sales worldwide in 2009, only behind the works of Pablo Picasso and Andy Warhol.